Well, this was bound to happen, right? I actually spent time over a week ago, playing around with derivative graphs, wondering about gender roles. This is uncharted territory. QSINE: How bad is it out there? 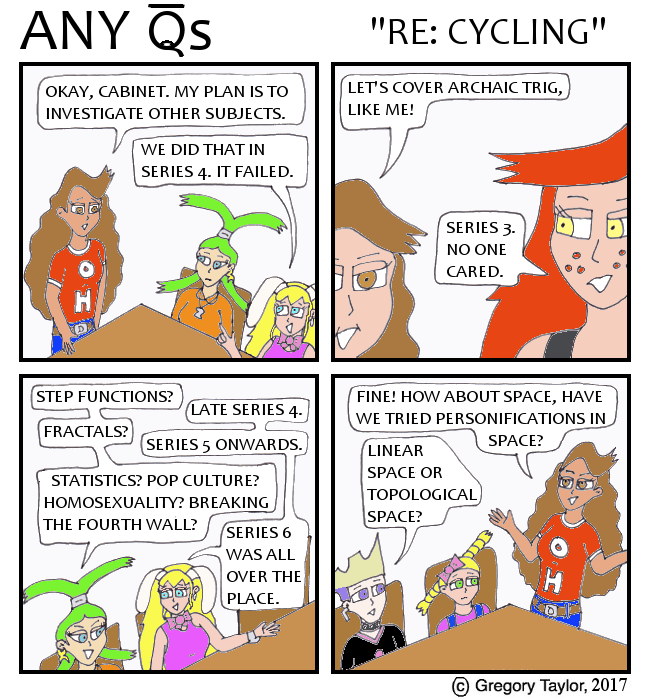 QLYN: Before word spread, we lost QT, QArcSin, QElly, Root, Rhys and Tangent. QSINE: Can the virus be spread by contact? QLYN: Maybe by static shock? We’ve no evidence yet. QLYN: We’ve quarantined all who were affected. Arctan is tending to them. RHYS? : I told you, I’m Rhys! x^-1! ARCTAN: Your gender reassignment is nowhere on record. For other reading, I recently participated in an interview on Alastair Luft's website; he's interviewed a number of other writers. I also wrote a short story for post #300 on my personal site - there's a magic bunny (sort of)! QT? : First I turned into a cubic, now I’m quadratic. QSINE: So this virus is biological. QT? : Except my i-Pad shocked me before I changed. Each time. 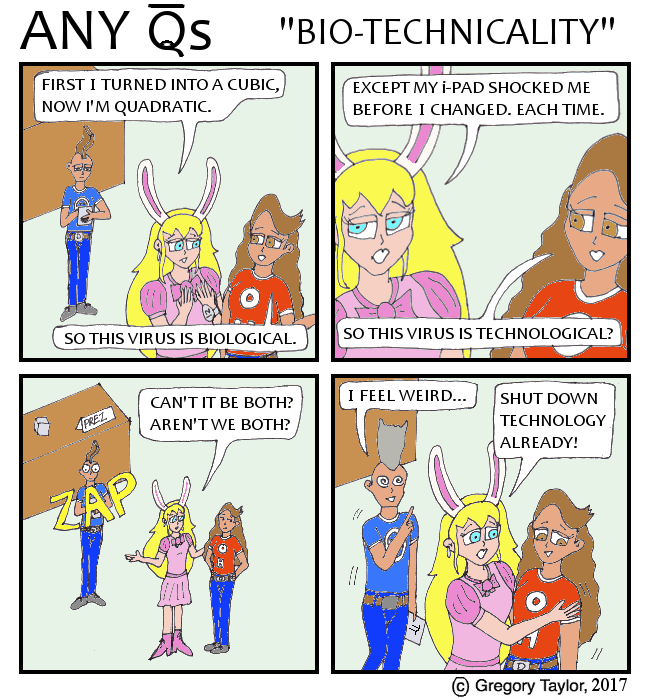 QSINE: So this virus is technological? QT? : Can’t it be both? Aren’t we both? QT? : Shut down technology already! Thanks to John and Scott for comments last week, giving me a direction. If I do this right, you may think I planned it this way. QT? : Emergency! Sine needs to shut down all technology, fast. ARCSIN: Sine’s talking to cabinet. What’s this about? QT? : A virus has spread from the election database. ARCSIN: You don’t have database access. Who told you this? QT? : I have access. I’m a parent function. ARCSIN: You look like 12x^2 to me. QT? : I’m QT. I’m Quartic! ARCSIN: Your choice of cosplay isn’t my concern. QT? : Will you just call Sine before things get any worse? Where do I go now? What might people read? Anyone?? I considered personifications for death, time and love, only to learn the movie "Collateral Beauty" already did them. Incidentally, the banner for the new year is now up on the Facebook page. QSINE: Okay, cabinet. My plan is to investigate other subjects. PARA: We did that in series 4. It failed. VERSINE: Let’s cover archaic trig, like me! EXPONA: Series 3. No one cared. QHYPER: Statistics? Pop Culture? Homosexuality? Breaking the fourth wall? PARA: Series 6 was all over the place. QSINE: Fine! How about space, have we tried personifications in space? GAMMA: Linear space or topological space? Pronunciation makes all the difference there. Welcome to 2017! I remembered to update the (c) year. QSINE: You wanted to talk? 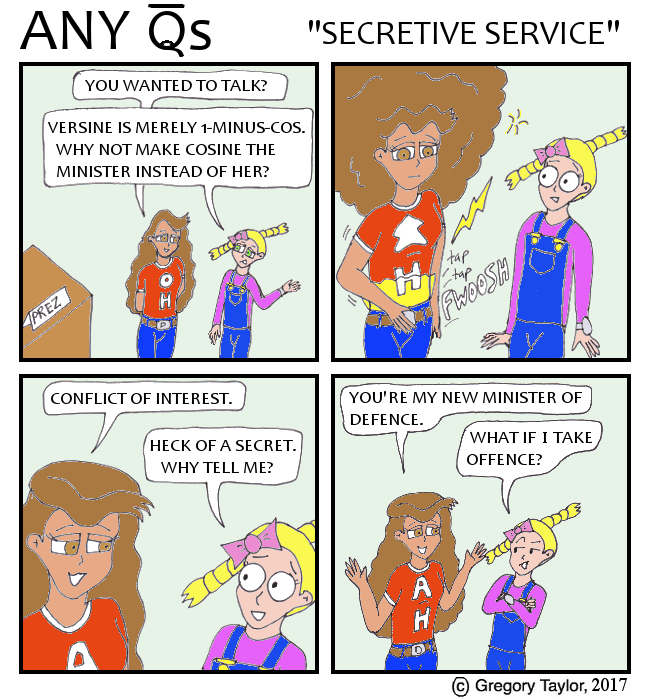 QLYN: Versine is merely 1-Minus-Cos. Why not make Cosine the minister instead? QLYN: Heck of a secret. Why tell me? QCOS: You’re my new minister of defence. QLYN: What if I take offence?